I had a blast meeting up some other photographers from the Front Range Focal Plane Meetup.com group late last month to experiment with some light painting. We spent a few hours out at Commons Park photographing the Highland Bridge, the Platte River and other areas near the downtown area of Denver, Coloardo. This photo was made with the help of Andy Johns who is the founder of the group. 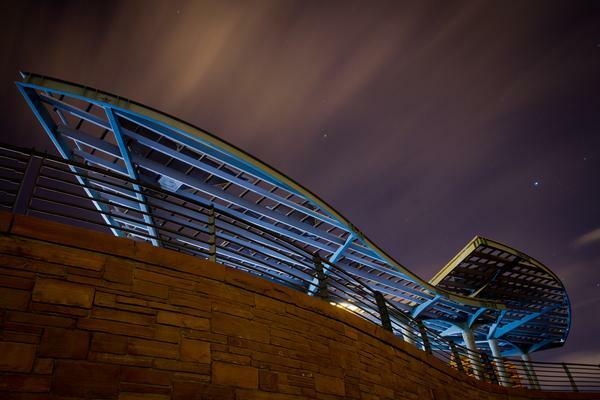 The metal structure sits in Commons Park and has no lights hitting it besides a bit of light from the city to the East. So it was a perfect subject for some light painting. All of the light was added from Andy firing a Nikon flash several times across the structure during a 42 second exposure at f 9.0 at ISO 200. You can see some more of the photos I took during the event on my Flickr page. We played with a Andy's hallogen light painting a bridge as well as some of the art in the area. I also took some photos of other scenes I found interesting during the night's escursion. In case you haven't ever done light painting. It usually involves adding light either with flashlights, strobes or other sources of illumination to create a photograph that wasn't already there. Usually no two images created in this manner are the same. For another photo Andy illuminated the Highland Bridge over the Platte River with his high powered hallogen flash light. This lit up the spires and the bridge structure quite nicely and probably scared a few of the people using the bridge too. There were about 7 or 8 of us out there playing and experimenting. And in truth that was what it was all about- having some fun and getting more experience. If you are intersted in trying your hand just find the group on MeetUp.com. There are some regularly scheduled activities whether it is light painting or other events.